1. Low-calorie portion controlled diet: Successful weight loss maintainers continue to act like recently successful weight losers for many years after weight loss. They do not believe in a transient change but a lasting change in lifestyle and dietary habits. We typically ask our patients to limit their carbohydrate intake during the daytime and eat between 1200 and 2000 calories each day. We have them weigh in once a week to make sure that their calorie/carbohydrate intake is not causing weight regain. Often meal replacements are used to substitute for meals so there is fewer stimuli to eat more types of/ quantities of foods and a known carbohydrate/caloric intake is utilized. Diets that typically vary more lead to weight regain whereas diets that are simplified and restricted to less food types lead to improved weight loss and weight maintenance. The National Weight Control Registry has indicated that people who keep 30 pounds or more off for six years typically have an average intake of 1400 cal. Obviously people with more muscle mass can eat more in this typically refers to men. Women, typically have less muscle mass and as result need to have less caloric intake. 2. Exercise: Exercise can be as simple as 3 1/2 hours per week or 2800 calories per week of physical activity. 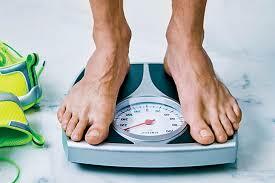 Patients who tend to keep weight off average 2500 calories per week for women and 3300 calories per week for men. Also limiting TV viewing time and limiting eating out to less than once a week seems to be beneficial. The average American male watches 29 hours per week of television in the average American female watches 34 hours per week of television. There is a 25% risk of obesity for each two-hour block of sedentary activity done each day. Therefore it is important to get up and move. Body movement burns energy due to skeletal muscle use and it maintains physical fitness and decreases the risk of cardiovascular disease, obesity and diabetes. Does exercise produce weight loss? The answer is yes as physical activity typically is shown to influence approximately 3% of total body weight in most studies. Also, the average weight loss per week of exercise alone is 1 pound. Brisk walking is the standard in all programs. A simple rule is some exercise is better than none and more is better. There are many smart phone applications that can determine calories utilized when walking. Look for them as we often recommend to our patients to simply walk more. For those more fitness oriented, weightlifting or weight resistance exercises can be beneficial as this is the only way to build muscle mass or increase your metabolic engine. Always check with your doctor before starting any physical fitness program. 3. Behavorial Therapy: Self-monitoring is a basic behavioral technique to maintain weight loss. If there is no consistent monitoring there is typically no success. Set goals based on realistic baseline levels of activity and sedentary activity. An initial goal of a 10% increase of activity will hopefully lead to achieving moderate intense activity of up to 3 to 5 sessions per week and 30 to 60 minutes per session. Increase positive behaviors by making a social commitment to friends and family that you are losing weight and for them to encourage you to stay committed. This will improve your motivation. Know who, when, where, how long and with whom you need to keep associated with to maintain weight loss. Decrease stimulus cues that often increase eating behaviors. This could be as simple as spending less time in the supermarket or spending less time at the dinner table. Also, make it easy to exercise by keeping exercise clothing and footwear nearby exercise apparatus. Change your environment, rearrange your schedule and get exercise equipment out of storage or from under the bed or out in the garage and put in a place where you will likely use it. Also decrease stress by doing breathing exercises or meditation. Those who join exercise clubs with their spouse have a higher adherence rate showing social support is important. Therefore try to be around others who lead healthy lifestyles and buddy up with a friend to help reach your health goals.